Bonsucro is pleased to announce a set of dates for Bonsucro Technical Weeks around the globe in 2017/2018. Bonsucro Technical Weeks are events aimed at increasing technical knowledge, connecting with peers and introducing new tools and resources. They include introduction training, auditor/expert qualification training, an introduction to Bonsucro Connect , Technical Experience Sharing sessions, and field trips. 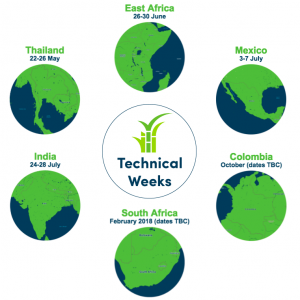 See below for dates for Technical Weeks around the globe. What’s Included in the week? Translation: The events will be held in English with local interpretation available when appropriate.